Growers who use artificial lighting usually prefer high pressure sodium (HPS) lamps to do the job. Not only do HPS lamps have a very high photon flux but compared to metal halide (MH) lamps they have a much more prominent red spectral component and therefore a significantly larger dose of photosynthetically active radiation (PAR) per watt. However during recent years light emitting diode (LED) lamps have become much more efficient and have started to compete for the artificial lighting domain. However is there any advantage to using LED lights over HPS lamps? Are HPS lamps always going to be the winners? Today we are going to look at the science comparing HPS and LED lamps to see if there is currently a winner between the two. The above graph shows you the PAR spectra. Basically this tells you which wavelengths of light are most prominently absorbed by plants. 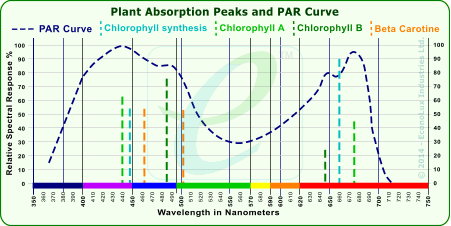 From this diagram it is clear that plants have peak absorptions around the blue and red parts of the spectra while the green section of the spectra is absorbed much less intensely and instead reflected (the reason why most plants look green). Ideally we would want lamps that have peaks in the regions of the spectra where the PAR peaks as well and we would like to have the highest peak in the red which is the region where we get the most efficient photons for the photosynthesis process. In HPS lamps our spectra is basically fixed by the nature of the light source while in LED lamps we can tune the light source a lot. This is one of the reasons why there is such confusion when comparing HPS and LED lamps. Since LED lamps can be tuned so much it isn't surprising that there are a large variety of cases where growers have experienced worse results from LED lamps compared with their HPS counterparts. With HPS lamps you basically buy one 1000 W lamp and you're done while with LED lamps things such as the color distribution of the diodes being used and the focusing elements they have installed can make a tremendous different. 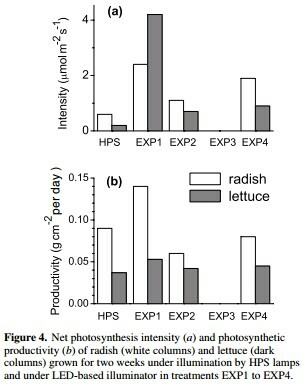 Checkout this study comparing LED and HPS lights to grow lettuce and radishes. The picture above shows you the results they had with HPS lamps compared with 3 different experiments using different LED distributions. A person running setups 2 or 4 would have thought that LEDs are worse than HPS lights while someone using setup 1 would have concluded that LED lamps are simply much better. This is why some growers will tell you that LED lamps are the greatest thing on earth while others will tell you they are never as good as HPS -- they simply have used different lamps. Notice that in setup 3 a complete breakdown of the photosynthetic process happened. In the above experiment growers used 4 LED types, 455nm, 640nm, 660nm and 735nm LEDs in a roughly 10:120:10:1 ratio. In setup 2 the 640nm LED intensity was reduced by a factor of 1.5, in the setup 3 the 735nm component was changed to nighttime only and in setup 4 the 735nm LED was changed to only two hours during nighttime. You can see how the decision to change a light source that contributed less than 2% of the total light flux to nighttime had a very important effect. This is because the 735nm wavelength has a circadian rhythm effect that can substantially change how the plant responds. Just turning on 2% of the LEDs at the wrong time completely turned around the results. With the above it is not surprising that we find contradictory evidence in the scientific literature. Articles like this paper on cucumbers find that HPS provides better growing efficiency compared to LED lamps in line with other articles like this one on lettuce. However we should bear in mind that the LED lamps used are always different and the fact that a LED array provides worse results compared to HPS does not mean that this is true for all LED lamps overall. Since LED lamps can be tuned so much it is almost certain that for a given plant specie you will always find an LED combination that gives you at least the same results as an HPS lamp. Nonetheless the power savings from LED lamps also need to be considered. 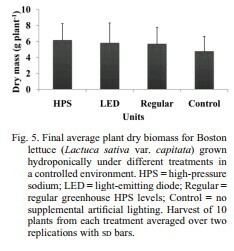 In experiments where comparable photon fluxes are used LED lamps tend to provide savings of at least 30-40% in terms of power consumed from the lamps only while these savings can reach even higher values when considering the additional cooling needs of HPS lamps (that are often much lower for LED lamps). Per the above LED lamps are definitely worth considering as a replacement for HPS lamps. However you need to properly build your LED lamps such that the photon flux and spectral composition does provide you with results that can surpass those of regular HPS. Building a lamp that is underpowered or that has an inappropriate spectral composition can indeed cause you to get results inferior to those of HPS lamps. This is most probably the reason why so many growers are so reluctant to move to this type of solutions when using either only artificial or supplemental artificial lighting. Dear Daniel, Thank you very much for your research. The paper you are referring to (High-power light-emitting diode based facility for plant cultivation by Pavelas Duchovskis) is quite old (issued in 2005). Newer results are much more promising. I've been doing some R&D with the newer generation of LEDs. My understanding is that although the older ones with the blue and red diodes had better photon efficiency on paper, the real-world results were highly unimpressive. I'm testing out some of the newer full spectrum LEDs made by Nextlight, Fluence, or Pacific Light Concepts. These are very similar technology, the first two having many small diodes, and the latter using COBs. I set up the test rooms with equal PPFD at canopy as I'd use with DE-HPS. There's a minor savings on power cost for the light itself: The photon efficiency of the Nextlight Mega, for example, is 2.15 umol/watt, and the photon efficiency of a DE-HPS is about 2.0 umol/watt. So you're getting about 7.5% more photons per watt with the full-spectrum LEDs. Over the size of a large facility, 7.5% drop in lighting cost for equal PPFD at canopy is pretty good. As you say, the other major component is heat. The LEDs produce very little IR and require about 3.5 BTU/watt of cooling, and DE-HPS require about 5 BTU/watt. So you're saving perhaps 30% on air conditioning as well. There's a bit of a learning curve with LEDs. Since the plants are exposed to much less IR, the transpiration/cooling demands are much less and they seem to use less water. Because of this, mine require much higher EC levels in the block to keep from showing deficiencies. First test run got about 57 g/sq ft. with the LEDs, running 41 watts/sq ft. (considerable power savings), which is within the expected range for HPS-DE as well. PPFD at canopy was 850-950. Good results; even so, I'm going to do some more testing before we implement them commercially. If you'd like to see some photos from the R&D room I can point you in that direction. Really enjoying your articles.